I recently posted an article in which I suggested that the “church” existed well before the New Testament (before the Gospels or Acts). The thoughts rose out of some teaching sessions I gave in a Missiology course, one where our driving focus in discussing “church” (or any topic) is that of mission. I centered a lot of the discussion around linguistics. The word we use, “church,” comes from the Greek ekklesia. Most are aware of this. However, this word ekklesia – generally meaning assembly, gathering, or congregation – was also used in the Old Testament to describe God’s old covenant people of Israel. It’s just that the Hebrew word is qahal. But both – ekklesia and qahal – mean and are translated in English as assembly, gathering, or congregation. So, when the old testament Hebrew Scriptures were translated into Greek around the 2nd century BC, the word that was normally used to describe the gathering of God’s old covenant people (qahal) was translated into the more well-known Greek word, ekklesia. My point: God has always had his qahal, his ekklesia, his church. Or he’s always had his kerk (Dutch), kirche (German), iglesia (Spanish) and église (French). Now, I had some pushback on this idea of the ekklesia, or church, existing prior to the New Testament. And the challenge, many times, comes out of dispensational circles – a perspective that unequivocally distinguishes between old testament Israel and new testament Church. But the perspective that says the church began before Jesus and the apostles can sound disturbing to just about any Christian. 1) The linguistic connection (between qahal–ekklesia–church) does not inherently mean the new covenant people and the old covenant people are the same group. I understand this. 2) I very much believe that there are great aspects of discontinuity between the old and new covenants. But let me emphasize some things. I actually do truly believe the linguistic study is worth noting in thinking through the continuity of God’s people. It’s very similar to looking at the word usage in the old testament for say, kingdom (Hebrew malkuth), and the use of basileia (Greek for kingdom) in the new testament. Of course, moving from old to new, there is movement forward, movement of change, in regards to the fuller understanding of the kingdom of God. Actually, even though we primarily emphasize the harmonious nature of Scripture, yet because it’s a very eclectic library with many voices speaking into varying issues, you’ll get differing flavors about an issue within the same testament. But, I suppose as we look to grasp a more holistic understanding of the voices, we see distinctive, differing characteristics across the 2 testaments. The old, at least at times, presents a more myopic understanding of the kingdom of God. Kingdom is centered mainly in one nation, Israel, with one city as its great post, Jerusalem. It’s unfathomable to think this way as new creation is initiated in the fulfilling work of Christ, capped by his resurrection and ascension to rule over all. The new testament begins to bring significant clarity. Of course, you have the greater voice coming through the Hebrew Scriptures declaring that God’s kingdom will be unto all and into all. However, there’s still an obsession with one plot of land and one city within the middle east. I’d posit that Jerusalem is no longer contained within modern-day Palestine, but rather now reaches to the four corners of the earth. Still, this is the same kingdom rule of God within the unfolding drama of the two testaments. And one might add that what we read on the pages of Scripture still pales in comparison to the true and full reality of the kingdom of God. And this, I believe, is similar in discussions around God’s people. God always intended a people much larger than the chosen nation of Israel. Start with Abraham and his descendants……but break this thing out so that all families of the earth will be blessed. The kingdom of God, the people of God, the city of God, the temple of God, the land of God has been expanded to God’s original intention, expanded beyond the pages of the old covenant. But there is continuity across the story. All stories hold continuity in some form and manner. And that’s my focus – understanding the people of God as the actual people of God makes sense as we engage the whole story. Ekklesia doesn’t make sense without qahal. Church doesn’t make sense without ekklesia and without qahal. It’s one story. And new covenant ekklesia gives a much fuller understanding of the work of God than old covenant qahal (as I might also add that the present-day global church gives a much fuller understanding of God’s sweeping story, though I mean not that we need add unto holy scripture). As one moves into The Return of the King, the story that began in The Hobbit, The Fellowship of the Ring and The Two Towers makes much more sense. But The Return of the King is very much connected to initial story in The Hobbit. Thus, as I listen to the symphony that is played across the pages of Scripture, I see pulsating notes that continue from beginning to end…and on into today. A people were begun in Abraham. That’s where Gen 1-11 is taking us – Abraham. And now it’s those who are in Christ, both Jew and Gentile, that are of the family of Abraham. 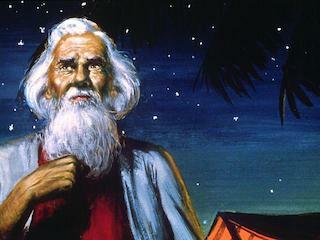 The story of Abraham started very small. But the family has busted the seams of the wineskin, spilling over into all nations. And the mission of God begun in those Abrahamic times, penned in places like Gen 1:28 and 12:3, continues amongst the people of God we read of in the Gospels, Acts and Epistles. And here it continues today in the pages of the church of Africa, Asia, Americas, Europe, etc. The qahal of God continues. The ekklesia of God moves forward. And we might just soon break into the act known as the return of the king. But this storied people is of one story in God. This entry was tagged church, mission. Bookmark the permalink. “I believe that mission is best understood when we see the mission of God being made known from the beginning – starting in Genesis 1” Yup. One people of God, one story, different administration. I understand what you’re saying, and I want to maintain some discontinuity. But the phrase “different administration” still speaks of staying connected to the root of dispensationalism. I sense that will continue to not allow for one sweeping & unfolding story. If I remember correctly, that is your’s (and DTS’s) perspective, albeit a “reformed” or newer focus these days. It always seems a way to dodge being identified with Scofield, etc. I think a lot of stuff is better these days, but the root still seems there. And I’m not so CT committed these days. I’m baffled and wonder if you are getting hung up on semantics. I’m essentially agreeing with you, which btw is not a dispensationalist position. I’m essentially saying that there is a continuity of the people of God and the church is in the OT. Christ’s inauguration of the new covenant has brought a change in how the church relates to Christ (Jer 31:31-34).The new covenant changes because of the consummation of Christ’s fulfillment, That doesn’t mean the church started at Pentecost, which is the dispensationalist position. I’ll try to find some citations from people who are definitely NOT dispensationalist and solidly Reformed who have used that same language.. .
It’s good. Just sometimes concerned by dispensationalism at times. But there are some things we need to listen to within that perspective. Hi Scott, You are out of the lowlands but not forgotten – brother. One piece of info to consider is what Jesus said as reported in Matthew 16:18 “…on this rock I will build my church, and the gates of hell shall not prevail against it. Specifically how Jesus said “MY CHURCH.” I agree that from Abraham God was calling a people to be his people qahal. Jesus comes in continuity with this and- if this phrase will bear the weight, – He is about to build something new in his own name. Continuity and discontinuity. Was this to be a Hells Gates overcoming church whereas the previous ones had not been? So wonderful to hear from you. Again, I believe something new is being built. But not new in totality, but in newness of renewal, towards the original intention of God that was to be fulfilled in Messiah. An acorn has the reality of an oak tree in it. But it takes time to get there and see the fuller picture, not to mention some pruning will be needed and renewal. At times, we look at the oak tree and don’t think acorn. At times, we look at the new covenant people of God, Christ’s ekklesia, and don’t think original intention of God started through a people in Genesis. I think covenant theology has a better grasp on the sweep of Scripture than, say, dispensationalism. But my commitment is not to covenant theology. We cannot steer from this 100%, and I am no biblicist. But I think Scripture is not a “systematic, harmonious” document as usually espoused by evangelicals. It is a text telling a history of God’s people (though not always historical in genre), allowing multiple voices into the library that is the “66-book” bound Protestant canon. Note, I lean myself toward the so-called PD or Progressive Dispensationalism (as many in and from DTS these days), but even here we cannot escape the full dispensational essence, of the Jews (now Modern Israel), the Gentiles (surely almost now in a free-fall of Apostasy… in our day towards their once belief in Judeo-Christianity and the Church of God!) For those so-called theolog’s that cannot see the great Judeo-Christian loss today, I feel a great sadness! The visible church is quite under a modern/modernity, with postmodern seizure and attack at every level. To miss this is indeed part of the great apostasy upon us in the West! From theology, to sexual ethics! PS…I meant to quote too, John 7: 39 after my first sentence! A most important verse, and from the lips of our Lord Jesus Himself! Again, 1 Peter 2: 4-6, etc. “So the honor is for you who believe, but for those who do not believe, “The stone that the builders rejected has become the cornerstone,” AND “A stone of stumbling, and rock of offense.” They stumble because they disobey the word, as they were destined to do.” (Verses 7-8) Strongly suggest the doctrine of GOD’s “reprobation”! Somehow I feel our conversation/discussion will be unfruitful, but I’ll share a few thoughts and let it be. Of course, the NT ekklesia didn’t exist until the “NT”. But that doesn’t mean God’s ekklesia did not exist. Kingdom, temple. priesthood, land, etc, all existed in the old Hebrew setting. It’s just that the new covenant breaks this out of the myopic, foreshadowed concept. Healing existed “prior to the resurrection.” It’s just that the death & resurrection makes it explode onto the scene in the way God intended. I’ll let you read the gospel of Luke and ask the question – Are any Gentiles “saved”? And if it’s only a Gentile oriented thing, then maybe we don’t have “church” until Cornelius & family come along? I believe something amazing is on the horizon for the western world. But we needed a time of tearing down present-day Christendom (already done in Europe and probably on it’s way over the next couple of decades in America) so that something authentic might be built. *As we can see in John 14: 16, “Comforter” (Gk. parakletos, rendered “Advocate” in 1 John 2: 1). Always simply Bible Text before “theology”, or a “Biblical” theology itself! And simply here “dispensationalism” is closer and rightfully handed: indispensable! *Indeed WE simply don’t agree about the nature of the so-called Historical Church! Again, WE are quite seeing the depth of Gentile Apostasy! And apostasy is always irremediable, and must await God’s judgment! In many ways St. Paul’s Letter of II Timothy is His ‘Last Will & Testament’ to the Church! *And yes, the Book of Acts, is about the Church (singular) on earth, begun…but of course not ended, until “the coming of our Lord Jesus Christ, and by our gathering together to HIM.” (2 Thess. 2: 1) And yes, St. Peter fulfills Matt. 16: 19, in the Book of Acts itself, as to both Israel, Acts 2, and Acts 10, for the Gentile Cornelius and his household! Note, Acts 28: 17-29 the final offer of the Gospel to the Jews collectively, and the movement to the Gentiles.